Enjoy a personalized painting event when you plan a private party with Pinot’s Palette. Choose from our vast library of original paintings, or have one of our skilled artists design a custom masterpiece for your event. Boost your team's creativity with a one-of-a-kind corporate team building event. Our paint parties spark collaboration and leave your team inspired and ready to create. Our artists will lead the guests step by step through the painting you select. We'll have music playing to create a fun environment. You are welcome to bring food and drinks including wine and beer. We have the wine glasses, corkscrews, ice, ice buckets, and paper goods for any food or drinks you bring. Large group discounts are available. This black light paint party is perfect for teens and adults. Guests will enjoy a 2 hour party creating their own 16" x 20" canvas painting with an artist guiding the group. Guests will receive glow accessories such as glow wands, bracelets, necklaces, etc. We'll keep the music going and the energy high. Guests are welcome to bring food and drinks. Large group discounts may apply. 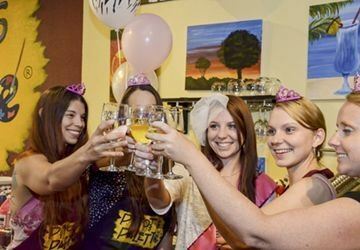 Rent out our paint studio for bridal showers, baby showers, book clubs, networking groups, and corporate meetings. Tables can be covered with white linen tablecloths upon request. This offer is valid based on availability and is not valid during our peak hours on Friday nights, Saturday afternoons or Saturday evenings, special events, or other peak times. Rent out the main studio room in our studio for bridal showers, baby showers, book clubs, networking groups, and corporate meetings. Tables can be covered with white linen tablecloths upon request. This offer is valid based on availability and is not valid during our peak hours on Friday nights, Saturday afternoons or Saturday evenings, special events, or other peak times. This location is a fun atmosphere for paint and sip events. We also host bridal showers, baby showers, birthdays, networking meetings, studio rental, etc. The environment is an active art studios covered in paintings and a music system to play your favorite tunes.